For over 2 years.. hell since Nov 8th, 2018 the Left (democrat party, media, obama regime, Deep State operatives, special interest and their minions) have been pushing a now proven outright lie. The President of the United States, Donald Trump, NEVER engaged in collusion with the Russians, there was no effort by his admin/ campaign to steal the election from Hillary Clinton with the Russians help. Keep in mind Mueller was looked upon like the Left’s savior as he employed 19 democrat attorneys who supported Hillary Clinton. He an his team of attorneys employed “40 FBI agents, intelligence forensic accountants, and other professional staff. The Special Counsel issued more than 2,800 subpoenas, executed nearly 500 search warrants, obtained more than 230 orders for communication records, issued almost 50 orders authorizing use of pen registers, made 13 requests to foreign governments for evidence, and interviewed approximately 500 witnesses,” at an estimated cost of $25M, courtesy of you the taxpayers to investigate a pack of lies orchestrated by Clinton and the Left. It should also be noted Mueller’s investigation was never impeded by Pres Trump as the Left fearmongered he would do or go so far as to fire Mueller.Mueller did his job and now the results are in where of course democrat leaders Jerry Nadler, Adam Schiff etc are not happy. They will now enter their second phase of the witch hunt/ fishing expedition where Mueller and the AG will be called to the Hill to explain themselves! Aside from all the back and forth on this failed coup you’re hearing NO ONE is talking about the chaos it has created for Americans. Lie after lie has been cooked up by Leftists that has permanently divided this country. NO ONE is talking about all the hate, harassment, censoring of conservatives (online and real world) and violence committed against Trump supporters that is DIRECTLY tied to the Russia Conspiracy! From Press Sec Sarah Sanders getting kicked out of a restaurant to the Convington Catholic kids being attacked by the media, all that hate is rooted in the conspiracy theory Trump was colluding with the Russians and stole the election from Hillary Clinton!! Go watch videos of the attacks, you’ll hear attacker spewing lies and hate, in some cases calling their victims Putin bots, Russian collaborators, or that they back a President who is traitor to the country. Everything going on is all tied to the LIES the Left has been shoveling out every single day. The Left needs to be held responsible for the damage they’ve done to the USA. The massive lawsuits like those on behalf of Nick Sandmann against Washington Post and CNN need to come out and guys like fmr obama CIA Dir John Brennan need to be charged with crimes of subversion, potentially insurrection. We cannot have those involved in this failed coup from Comey to Clinton walk away from shrugging their shoulders as they concoct new conspiracies as MSNBC’s Joy Reid has already done suggesting seeds of a cover-up have been planted since the Left didn’t get the outcome they wanted. We literally had a silent coup taking place involving members of the obama admin, potentially obama himself, who need to be indicted. 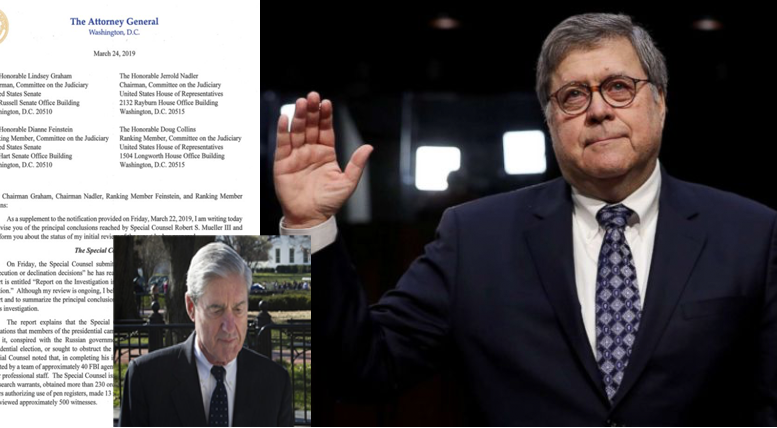 AG Barr is now going to be put to the test as to the type of AG he is going to be: prosecute those involved or follow the Sessions model being silent and inactive. … and understand after what we witnessed the Left is willing to do anything for power and control. They are very unhinged and becoming more dangerous by the day.